Artisan Restaurant & Cafe is not the kind of place you find accidentally. Hidden on a dead end Smichov street below Kinsky Garden, you have to know what you are looking for. 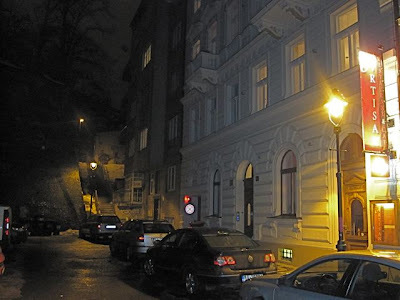 I knew about it because of the ads in the Prague Daily Monitor, and the relentlessly positive review on Prague.TV. I'd heard a lot had been invested to build a good-looking dining room. When we arrived on a Saturday evening, that information proved true. 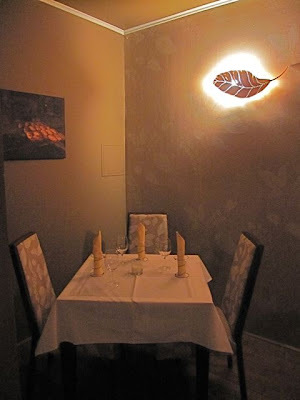 To match its green surroundings, there was a leaf motive on the beige chairs and walls, along with metal leaf sconces. The lighting was kept low, and the place had a romantic feel. Flash photography doesn't give a true feeling for the room. With some of the tables looking out over a back garden, it would be a good spot for a date. It also would be a nice place to sit outside in warm weather. 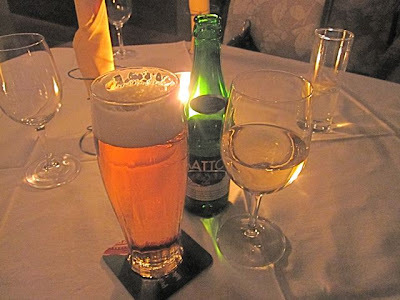 We started by ordering .15 liter glass of Dom ICI 2008 - Vignobles Dom Brial (80 CZK), Mattoni mineral water (35 CZK) and a half-liter of Pilsner Urquell (45 CZK). V liked the light, slightly sweet white. 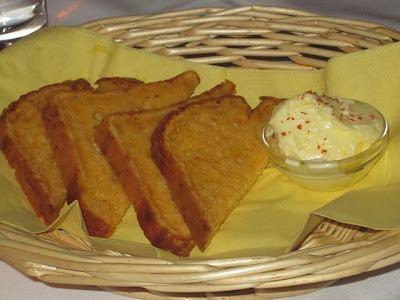 Warm cheese bread with butter was delivered to our table. V thought it was tasty, though I felt it was too heavy for noshing on before the meal. Among the starters that caught my eye were: spinach salad with duck crackling with bacon/lime dressing (195 CZK), goat cheese and roasted pepper bruschetta (155 CZK), and Lobster Rangoon (225 CZK). In the end, I went for the salmon ceviche with mango and jalapenos served on fried bread (185 CZK). I was very happy with my choice. The salty, marinated fish was a great counterpoint to the lightly sweet fruit. And the jalapenos' heat was cooled by a drizzling of crème fraiche. It was my favorite dish of the evening. V got the Caribbean salad with salad greens, mango, jicama, toasted coconut, red onions, and spiced pecans with raspberry-poppy seed vinaigrette (185 CZK). Always a fan of the exotic, she gave it a thumbs up. She said she detected cinnamon in the mix as well, and appreciated the flavor of the poppy seeds. I thought it would have been better if the lettuce was not so overdressed. 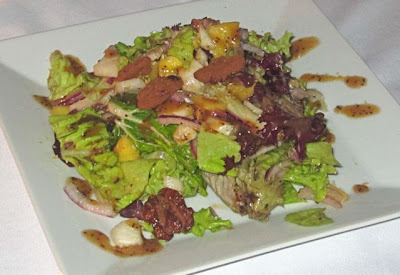 With the candied pecans, the salad was close to cloying. I didn't taste much coconut, but that might have sent it over the edge. I registered my observations with V, who rejected them and told me it was a good salad. We decided to switch to red wine, and I have to say, Artisan's wine list is the kind I like to see. About half the bottles were in the 400-600 CZK range, and all were either French or Italian, with no Czech wines. 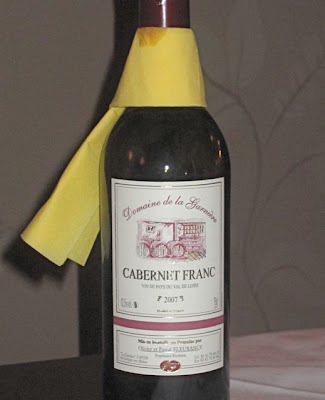 We settled on a bottle of Cabernet Franc from Domaine de la Garnière (475 CZK). The Loire Valley wine was medium-bodied and light on tannins. It may not win gold medals, but it stood head and shoulders above Czech reds I've had lately. I was pretty enthusiastic about it, but V said the nose wasn't so great. Still, it grew on her through the meal. Despite the choice of red wine, we ordered chicken and fish as our main courses. I had the jerked chicken with spicy tomato salsa and fried plantains (315 CZK). The flavor of the meat, with its Jamaican rub, was excellent. I'd give it a rave, but I must hold back because it was dangerously close to being dry. 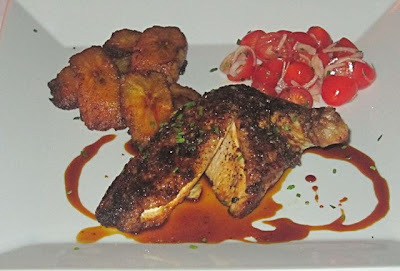 The crispy, savory skin, the sweet sauce underneath, and beautifully fried plantains saved the day. The plantains were sweet enough that I wondered if they were actually bananas. Either way, it tasted good. The tomato salsa was really a mini-cherry tomato and onion salad. It was tart and refreshing for the palate, but I wouldn't call it spicy. 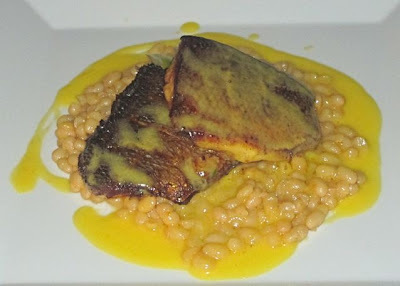 V got the grilled sea bass with white bean ragout, and an orange-carrot butter sauce (385 CZK). At first, she registered disappointment, expecting to see a whole fish on her plate. But after the first bites, disappointment disappeared and was replaced by satisfaction. The fish was light, fresh, and clean-tasting. The white beans were a fine pairing. The ethereal sauce, with a hint of carrot, was a buttery heaven. It was rich, yet light. Delicious. For dessert, I had to try to chocolate lava cake (165 CZK). Of all the hot, liquid-chocolate centered cakes I've had in Prague, and I've had many, I wouldn't rank this one so highly. 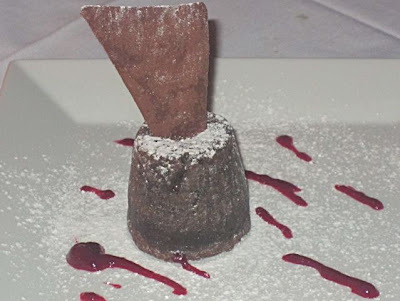 It was very small, the exterior was rubbery rather than cake-like, and I wished for some addition to the plate besides the intense berry coulis. 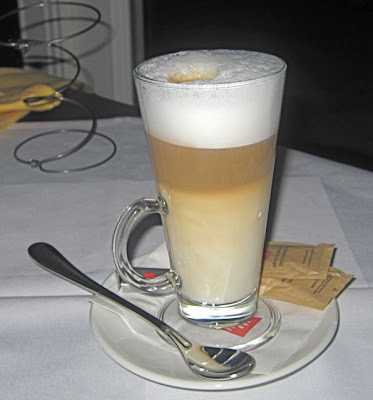 V had a bite of my cake and a cafe latte (45 CZK). I don't want to end on a down-note, so I've saved one of the best things about Artisan for last: the service. We had two servers, a young man and woman. They were masters of something I've had trouble finding in even the best and most expensive Czech restaurants -- the ability to be observant, but unobtrusive. They kept an eye on us and were there when we needed them, but they never intruded when we didn't. I can't tell you how rare that is. Unfortunately, I can't also tell you if it will always be like that. 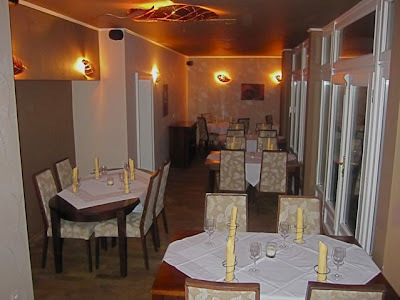 On our Saturday evening visit, we were the only customers in the restaurant. Which is a shame. The restaurant deserves better. Perhaps the portions could be bigger or the prices could be lower. Not every dish was exactingly executed. 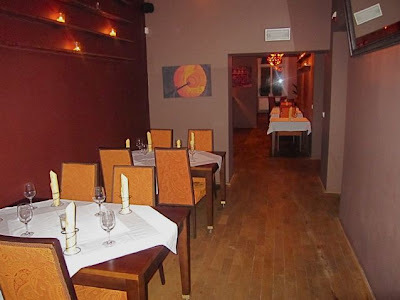 But more importantly, some dishes were great, we were well-cared for, there was a nice atmosphere with good music, and there were several items on the innovative menu I want to go back for. I wouldn't go as far as saying Artisan Restaurant & Cafe is a fine dining Utopia. Those are few and far between. But we liked our dinner enough to recommend it to friends, and I think it deserves a place on the city's culinary map. Checking it out soon. Thanks for the info.